I'm looking for four brave souls to give this a go. I'll be using the excellent VASSAL module to run the game. We'll be playing the Full Scenario with Period events, because why the heck not. If you'd like to give this a go, please post your faction preference in bold. While familiarity with FITL is not necessary, experience with COIN games is highly recommended, as this game can be fairly complicated in its various interactions. I'd also be interested in seeing some in-character commentary on the various events of the game, journalists or what have you, similar to what was done for the Twilight Struggle and Cuba Libre games, so please post if you'd like to do that. I'd like to update at least once a day, except on weekends. Good Luck! I am absolutely interested in FitL (I mentioned in IRC that I own the game but haven't had a chance to get it on the table yet), but since I haven't played it for real yet I will wait and let more experienced players step up first, so I don't gum up the works. If for whatever reason no one else comes along, though, I will happily play! Looking forward to seeing a COIN game in action. I don't want to play, but I would like to be a faceless peon suffering from the horrors of war. I kinda wanna play too, but I've never played COIN before, only watched. With that in mind, if I somehow do get in, US would probably be the most thematically appropriate. Sure, I'll play. Anyone but ARVN. Yes, please. I'll be the VC. Dibs on Walter Cronkite. I'm a huge fan of COIN games, so I'm interested to see how this plays out. Athaboros and Davin Valkri are first on the list in case anyone drops or I make another game. Let me know if there's anything wrong with the map. Good Luck, gentlemen! On Christmas Eve 1964, the VC deployed a car bomb that killed 2 and injured 60 at the Brinks Hotel. The attack demonstrated that VC terror could reach into the capital when desired. Cool, Fire in the Lake. I've always liked COIN but haven't played much other than a couple games of A Distant Plain. I'll be keeping an eye on this thread and maybe posting as some angry student protester/antiwar journalist/filthy commie propagandist later. Wow, I only just looked at the player aids and they're really nice. Are there versions for the other COIN games? Yep, all COIN games starting from AA had 4 copies of all player aids, one for each faction. No, the ones linked in the OP that look fan-made. There's some strategy advice and descriptions of prop rounds and stuff. Those ones are fan made although the included ones aren't half bad either. The same guy made one for A Distant Plain. I also just noticed that the play aid on GMT's website is not up-to-date. This should be the latest version. 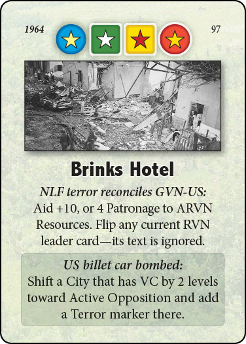 According to the rules, Van Minh is not considered a card and thus would not be flipped by the unshaded side of Brinks Hotel. Is this correct? leader box, such as for Pivotal Event pre-conditions. VC will perform Ops with no special activity. Pay 4 to Rally and place 3 guerrillas in Quang Tri- Thua Thien, 3 in Quang Tin- Quang Ngai, 3 in Binh Dinh and 3 in Tay Ninh. VC pays four to Rally in Quang Tri- Thua Thien, Quang Tin- Quang Ngai, Binh Dinh, and Tay Ninh. Three Guerrillas are placed in each of Quang Tri- Thua Thien, Quang Tin- Quang Ngai, Binh Dinh, and Tay Ninh. USA may execute LimOp or Pass. LimOp: Train to build 1 Irregular in Da Nang, then Pacify it two levels. EDIT: changed my mind, Tekopo is right. Letting the commies get first pick on the next card? Hmm, on second thought, you're right. Just pacify some cities so that all those VC guerrillas can't just walk in. US passes. USA Passes. ARVN receives three resources. ARVN may execute LimOp or Pass. LimOp: Rally in Can Tho, 2 police, 4 troops, gain +5 aid. ARVN pays 3 to Train in Can Tho. Four Troops and two Police are placed in Can Tho. ARVN receives +5 Aid due to Duong Van Minh. 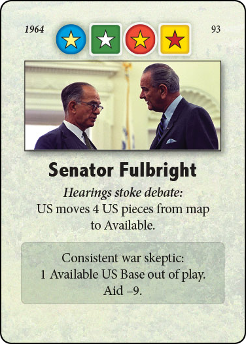 Senator Fulbright represented Arkansas from 1945-1975. The Senator was one of the sponsors of the Gulf of Tonkin resolution but later became a major critic of the US war effort. USA may execute Ops only, Ops and Special, Event, or Pass. Already?! 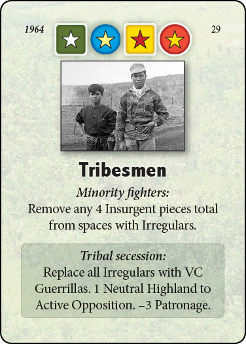 Wow, the deck wants a "restless" South Vietnam government, I guess. How many of those coup cards are in the deck again? Six! Four of these guys and two Failed Coups. The length until the next Coup card should make things interesting. Apparently, this guy outed the first guy after three months, so its fairly appropriate! I skipped my special activity so ARVN couldn't get oodles of aid off the event combined with lots of training actions, but I guess that's moot now and because I wasn't able to Tax I'm poor as poo poo! Train in Da Nang and Pleiku-Dahac. Place 1 Irregular in Da Nang and Pacify it 2 levels, then place 3 ARVN Troops and 1 Police in Pleiku-Dahac. USA Trains in Da Nang and Pleiku-Dahac. One Irregular is placed in Da Nang. Three ARVN Troops and one Police are placed in Pleiku-Dahac. Da Nang is Pacified two levels. 9 ARVN resources are spent in total. NVA may LimOp or Pass. 2 guerillas-base in North Vietnam, improve trail. NVA Trains in North Vietnam. Two Guerrillas are replaced with a Base, then the Trail is improved by one. Three NVA resources are spent in total. Nguyen Khanh becomes RVN Leader. Victory? 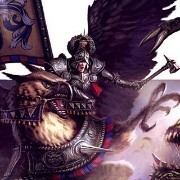 : No Faction fulfills its victory condition. Resources: ARVN gains 20 resources in Aid and 15 resources in Economy. VC gains seven resources from bases on map. 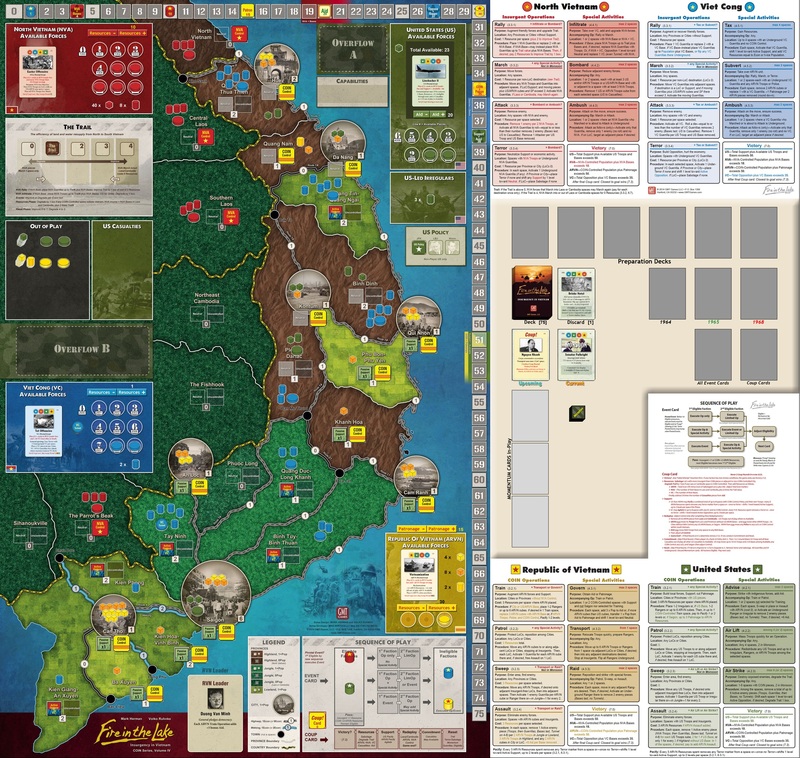 NVA gains three resources from bases in Laos and Cambodia, and four resources from The Trail. Support: USA may Pacify up to two levels in up to four spaces with US Troops, Police and COIN Control. Look on the bright side. That's one VP that the Americans won't be attacking anytime soon. Kontum, Saigon and Pleiku to Active Support. USA Pacifies one level in Saigon, two levels in Kontum, and two levels in Pleiku-Darlac. 15 ARVN resources are spent. 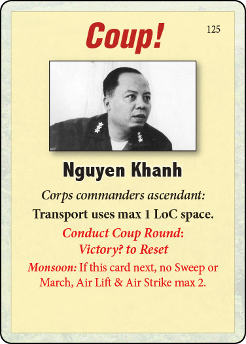 ARVN may Pacify up to two levels in one space or Pass. Increase Can Tho by one. Why not Hue? Can Tho has support already.